Pilates The Hundred as a Great Warmup! Pilates the Hundred or "Hundreds" as they are know in the Pilates community is the first in a series of 30 plus of the mat exercises that Joseph Pilates developed. It is a warmup exercise that begins most Classic Pilates mat workouts. This Classic Pilates Exercise not only warms and strengthens the abdominal muscles and the arms at the shoulder joint, but it also works the respiratory muscles with the quick pulse breathing associated with it. You can feel the respiratory muscles working just below the fold of your chest when breathing correctly. You will feel them pulsing up and down. And...it's easy to do Pilates the hundred anywhere in the world! Just check out the video below to find out where and how! There are many different ways to position yourself for this Pilates move. I will describe from easiest to hardest for you. 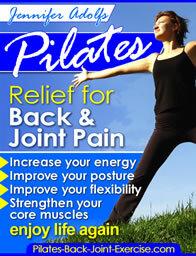 Lying on a Pilates mat with your knees bent, feet on the floor and arms long and just above your abdominal floor. Your head and shoulders can be lifted or down. Pulse your arms up and down at your side energetically keeping time to a 3-count breath, inhale like you are sniffing 3 flowers, and then a 3-count breath, exhale like you are blowing out 3 candles. Keep your head and torso still and unmoving as you pulse your arms at your sides like pressing a pile of sand on either side of your hips. Feel your abdominals flattening and widening. Find out how to do more great classic Pilates moves and modifications in the new Pilates Ebook available here. Lying on your Pilates exercise mat with your feet off the floor and knees bent at a 90-degree angle. Keep your arms long and just above your abdominal floor, your head and shoulders should be curled off the floor using your abdominal muscles to support the head. Feel a fold just under the chest and flatten the tummy. Make sure to keep the spine in a flat or neutral position, keeping the mid ribcage or shoulder blades connected to your mat. Pulse your arms up and down at your side energetically keeping time to the 4-count breath in and the 6-count breath out. Keep your head and torso still and unmoving as you pulse your arms like pressing a pile of sand on either side of your hips. Keep flattening the abdominals. Lying on a mat with both legs extended out somewhere between a 90-degree and a 45-degree angle to the floor. Head and shoulders are curled off with arms long and lifted. Imagine your breastbone being pulled up to the ceiling so you get more ab work to keep your head lifted. Caution: The farther you lower your legs the harder your abs have to work to keep the spine in neutral, meaning the ribs do not pull off the mat or you will have a pain in the back! If you feel a pull in your back and cannot keep your ribs connected to your mat then raise your legs higher to the sky until you feel your tummy flatten and your back stable. Keep your head and torso still and unmoving as you pulse your arms like pressing a pile of sand on either side of your hips. Free Pilates Online Exercise: Stability Ball Pushup. Leave Pilates the Hundred and check out the Cat Stretch to Relieve Back Tension.